Not even two days after closing the “Physical Graffiti” exhibition last year, I was restless to start painting again. There were paintings I needed to get down on canvas. This time I was drawn to some really large canvases, which at first, when I set them up in the studio, seemed monolithic and daunting. Then, led by a spark of inspiration I began to paint. Red. But not just red anywhere. Red Skies. This primary colour symbolizes many things, the foremost being love and passion, and I wanted to envelope my canvas with that feeling, sharing vibrant scenes of Vancouver, this city that I love. 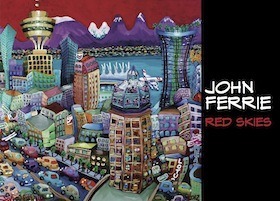 Red energizes the paintings in exciting new ways, giving new perspectives on familiar subjects; iconic buildings, streets bustling with cars zooming along, deep rich waters, pulsing lights and sublime red skies over this this ever changing and evolving city. The painting process began with a flat black gesso’d canvas, outlining the image with black graffiti KRink pen, then applying layer after layer of paint to create the shapes, shadows and light, all warm and inviting in a whimsical style. I hope this collection surprises and inspires viewers with the unexpected, taking their love for this city and re-envisioning it, making it fresh and new once more.